Here’s another one of Disney’s best-kept secrets… It’s called Disney’s Youth Educational Series. In short, your student (age 5 – 18), can take an educational class at the Walt Disney World Resort and your entire family could receive deeply discounted tickets! There are two ways to participate in Disney’s Youth Educational Series (Y.E.S. for short) – there is the Individual Program where students participate with a parent, and there’s the Group Program where students from a verified youth organization participate usually with a few chaperones from their organization. Individual Programs are typically available 5 months out of the year (Jan, Feb, Jun – Aug.) Group programs can occur year-round. What does your child love? Animals? Physics? Marine-life? Movement? With over 20 classes offered, you’re bound to find a class that will capture your child’s interest. Plus, it’s a class at Disney!! How many kids san say they ‘went to school’ at Disney?! However, your child will likely have so much fun, they won’t even realize they’re learning while on vacation! Most classes last about 3 hours long and many begin before the Parks open to the public – allowing your student to experience ‘an empty’ park. Pretty cool! Plus, your child may get to experience some ‘behind the scenes’ area of the parks – don’t worry, the magic isn’t ruined, it’s likely enhanced with the knowledge they gain! 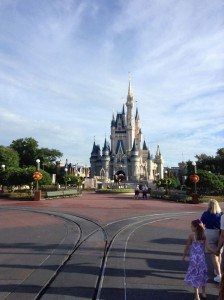 We joined up with a group traveling to WDW in September of 2014. We registered with the group in the Spring, selected our class and purchased our tickets. Our family of 4 saved over $710 on 7-Day Premium tickets. What a deal!! We made our own room reservation and dining reservations. Our tickets arrived in June, which allowed us plenty of time to plan out our park days and select our FP+’s in July. Students play with a solar car toy and observe how sun and shade affect it’s ability to move. 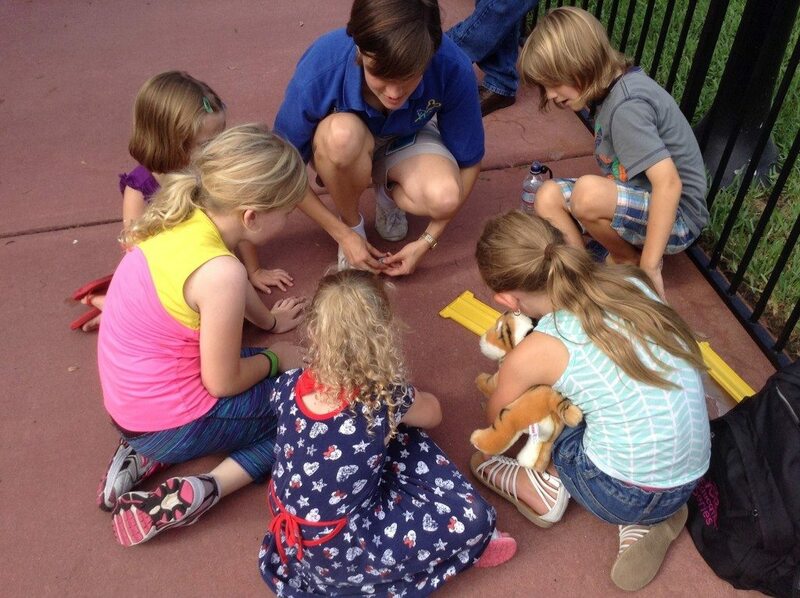 The class we took was called “How Things Move” and was facilitated at the Magic Kingdom. This class is meant for children age 5 – 8 years old (Kindergarten – 2nd grade) and is really well done! The children learned about the different types of energy – and how some of those forms of energy are used to operate the rides at the Magic Kingdom. We rode the Many Adventures of Winnie the Pooh, the Barnstormer, Dumbo and the People Mover. Between each ride, we discussed the types of energy used on that particular ride, and the facilitator pulled out a few activities from her bag to serve as an object lesson. By the end of this 2.5 hour class, the kids were well-versed in all forms of energy, and the parents had learned a few new things too! Did you know the People Mover is powered by magnets? How Can I Join a Group Trip? Easy! We’re hosting one this September (2016)!! Families with school-aged children are welcome to join! For ticket prices and classes offered, just follow this link: https://www.wdwhints.com/y-e-s-trip/ (or click on the “YES Trip” tab at the top of this page.) If September doesn’t bode well on your schedule, try finding a group (or even organizing one yourself). Remember, you must apply as an established, verifiable youth organization to qualify. Groups such as sports teams, church youth groups, girl/boy scout troops, school marching bands, etc. often take advantage of the Y.E.S. program. Most of the Y.E.S. classes begin before official Park opening. Students get to experience an ’empty’ park – what a perk! For more information on Disney Youth Programs, visit http://www.disneyyouth.com. Previous PostDisney Park Maps Coasters Review and Giveaway Next PostDisney on Ice Review: Let's Celebrate! Do you know anything about passholders using these programs? I don’t need Park tickets but would love to join an education class! Thanks! Hi Amy – It is not always guaranteed, but Disney usually allows AP holders to buy a 1-day YES pass in order to participate in a class. For our group, there are 2 ways Passholders can join – a paid option and a ‘free’ option. Disney handles Passholders on a case-by-case basis. Out of respect to their specific allowances to our group, I’d rather not post those options here for ‘all’ to see. ;o) If you’re interested in joining our Sept. classes, send me an email: [email protected] and I’ll let you know how Disney is handling Passholders for our group. I just ran the numbers purchasing 7 day base tickets at WDW for my family of through undercover tourist and through selecting a class with Disney YES. The undercover tourist tickets cost $33 less then the YES tickets. Everything I read says there is a discount using the YES program. Why am I paying more? Prices have once again changed/increased for 2016. The YES program no longer offers discounted tickets above 5-days. That is why your 7-day ticket is cheaper through UC. If you want a 5-day pass (or less) then the YES program is worth it… If you want more days, then UC is your best bet. We paid $150 (more than admission), missed school, and then the presentation didn’t work. I’ve been trying to contact someone to let them know and there’s no place to do it on the website. My son was so excited and came home completely let down and had extra homework! Are you planning a YES group for 2017? Kristen, if you are still looking to get into a group in the future we have a group that goes twice annually, which allows parents of students in grades 3-12 to jump into our group, Blue Ribbon Schools of Excellence. We have a June 2018 experience we are hosting at Coronado Springs and then a November 2018 experience at The Yacht Club that runs concurrent with our National Teacher Conference. It’s a great opportunity for families to get these rates. We even add our own curriculum so the kids are with us pretty much from 8-2PM, a little free time for the parents and the students get some really awesome programming around leadership. We have a group that goes twice annually, which allows parents of students in grades 3-12 to jump into our group, Blue Ribbon Schools of Excellence. We have a June 2018 experience we are hosting at Coronado Springs and then a November 2018 experience at The Yacht Club that runs concurrent with our National Teacher Conference. It’s a great opportunity for families to get these rates. We even add our own curriculum so the kids are with us pretty much from 8-2PM, a little free time for the parents and the students get some really awesome programming around leadership.